In our nearly-there effort to review the entire Van Halen-discography here at MR, one must also tally up their first Best Of-compilation, which seemed like an attention grabber to link onto the upon-release massively publicized 1996-reunion of original frontman David Lee Roth with the Van Halen brothers and Michael Anthony. While said reunion fell through the cracks, the compilation left in its wake does an alright job in collecting the best of a band with such distinct eras up to that point and also bringing a few remarkably good new tunes into the fold. With the old material, the song choices are understandable with the biggest single releases representing each album. Most of their records are represented by a single tune which does make for brutal cuts but it is what it is. Shame and even odd that Diver Down has been omitted completely while c’mon, Unchained is a great song but if one song should be representing Fair Warning, it’s Mean Street all the way. Both the Roth- and Hagar-eras are represented pretty evenly, all the way down to the new tunes which as said, are anything but the kind of cash-grab curiosities that one often relates to new material written for compilation-albums. For a “new” Hagar-offering, we get the dark-mood laced Human’s Being, which has some awesome vocal work going on along with hefty riffage and the kind of sweet solo work that one should expect. This tune would've fit really well on Balance and would've been among the record's cream. It must of course be mentioned that the song isn’t entirely new as it was already released on the soundtrack of Twister, which came out in the same year as this compilation. Still a really good tune. But the new tracks with Roth, which were supposed to usher in the reunion – good GAWD! If this was the caliber that the original foursome would have come back with in the latter half of the 90s, then sweet jumping Jehosephat did we miss out on a lot. These two tracks are awesome! Can’t Get This Stuff No More has the kind of mid-tempo swagger that cuts like Drop Dead Legs and Runnin’ With The Devil brought. If there’s anything holding it back, it’s simply that it’s left as the “other track” next to Me Wise Magic. Me. Wise. Magic. Seriously, how in the hell does a song this stupendous not get more play in conversations or radio programs or just anywhere! Can't be that it's simply stuck on a compilation. 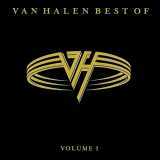 Seriously, I rank this doozy among the best tunes Van Halen has made. Ever. The verses have the kind of shadier touch all the way to Roth’s dark, spoken-style vocals that remind one of Fair Warning's powerful appeal. The wicked riffs flow along with that vibe. Then when we get to the chorus, the band’s signature wailing background vocals soar to the skies as Roth pulls off some seriously catchy mojo as well. This mother lodges itself into your head big time. Awesome harmonics in the background. Eddie’s solos scorch like lava and the ending flurry of guitar ownage is unbelievably sweet. Alex and Anthony groove like a shark throughout the track. It drives me mad to think that there might’ve been an album’s worth of music like this coming around ’96 if whatever ego clashes or other blocks were cleared. GAAAAHHHHHH I friggin’ adore this song! But all in all, this is in no way a complete compilation piece on Van Halen but it gives a good appetizer for those in need of the best hard rock on the planet. I’d say buy the sucker simply for Me Wise Magic, but otherwise definitely go quickly for the studio albums based on which era of VH you dig best.